Though those present no longer agree with all of the meetings conclusions, they are reproduced here for reference. We are against the authority of all governments, police forces, armies or hierarchy. No one can be free while a few have authority over many. Regardless of whether ‘Communist’, Capitalist, Fascist or Fundamentalist, we are against any state on the grounds of them being inherently authoritarian, hierarchical and oppressive institutions. We recognise that the role of the state is to protect the privileges of the few from the anger of the many. The economic system which has triumphed worldwide is capitalism. As a result we oppose capitalism as the world’s main system of economic oppression and enemy of freedom. Capitalism is based on exploitation of the working class by the bosses. Capitalism not only exploits and oppresses the majority of the world but also threatens our existence as its chase for profit leads to war, environmental destruction and job insecurity. The working class are both the biggest and most oppressed group in society and are actively oppressed by the ruling class. The working class must realise their collective class strength and overthrow capitalism and the state. We reject the need for political or ‘vanguard’ parties as only the revolutionary self-activity of the working class can win freedom. We cannot rely on the government, political parties or religious groups to do things for us – we must make the changes we want in the world ourselves. This is Direct Action*. Though lobbying and voting might do no harm, in such a biased system they don’t do any good either. Only an actively confrontational attitude to capitalism and the state can bring about real change. Only social revolution* can overthrow capitalism and the state and create a new society based on mutual aid, co-operation and freedom for all. b) Internal Communications Secretary: Writing and sending internal bulletin to members. c) Publicity Secretary: Type up minutes and post on boards and list. Send copy to Kate Sharpley Library. 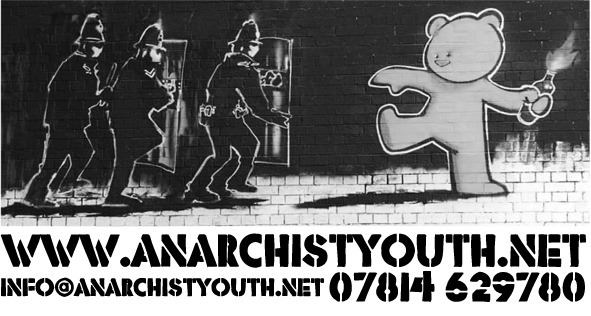 Publicise meetings and other events through Anarchist/Activist media contacts (and boujie media when necessary). Decided to elect someone when we have some money! Delegated positions are elected for a period of six months at which point the job is passed on to someone else. However, if it is felt that someone is not doing their assigned job properly, then they can be instantly recalled and replaced at the next meeting. If it is felt that a quicker decision is needed then it can be done on the discussion on boards/email list. All decisions can only be made at monthly meetings. Anything which needs a quick decision can be taken to the boards/list. Though all those present can take part in discussion, only those who have formally joined as members can take part in voting on decisions. Proposal that the network should be broken down into working groups for people who want to work on certain projects - publicity etc. Everyone should try and be involved in one of these. Should the network have to approve working group decisions and / or publications, or should they be able to do what they want? i) Meeting agenda is to be drawn up on the boards a minimum of 1 week in advance of the actual meeting. ii) Meeting chair and minute takers volunteer at the meeting. If possible, no one should chair/take minutes two meetings in a row. i) Should be written up and posted on boards and list (any sensitive details omitted for obvious reasons!). ii) A copy of the minutes should also be sent to the Kate Sharpley Library. Members should receive an internal bulletin on the group’s activities every two months. If it is possible, this should be done by email by the internal communications secretary to keep costs down. However, if someone cannot receive emails, steps should be taken to send it by post. 1. Only LAY members can vote on decisions in meetings, although non-members are permitted to attend. 2. Membership of LAY is subject to agreement to LAY Hallmarks as listed above, and being approved by at least one other LAY member. LAY will continue to use open AYN list, but also set up members-only email list on which decisions can be made. 2. Flyposting near colleges/Unis etc. New and improved: the Anarchy!